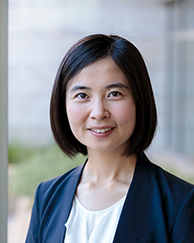 Wenxin Du studies global currency and fixed income markets, financial regulations, and emerging market finance. She has won several top academic research awards, including the Amundi Pioneer First Prize and AQR Insight Award Top Prize for her work on deviations from covered interest rate parity. Her research has been featured in Bloomberg, Financial Times, The Economist, and The Wall Street Journal. She has published articles in leading academic journals, such as the American Economic Review: Insights, Journal of Finance and the Journal of International Economics. Prior to joining Booth, Du held the position of Principal Economist at the Board of Governors of the Federal Reserve System, where she was responsible for monitoring and analyzing developments in international financial markets for the FOMC. She was also a central bank research fellow at the Bank for International Settlements in Basel, Switzerland. During her doctoral studies, she interned at the International Monetary Fund. She earned an A.M. and a Ph.D. both in Economics from Harvard University and a B.A. in Economics and Mathematics from Swarthmore College with Highest Honors.